Powerful photos in Danny Lyon retrospective at Etherton artfully "compress history"
Copyright Danny Lyon / Magnum Photos, courtesy of Etherton Gallery. “Maricopa County” by Danny Lyon, vintage gelatin silver print, 1977. Before Phoenix sprawled, before small towns like Buckeye and Surprise metastasized into McMansion bedroom communities, agricultural fields stretched across the desert as far as the eye could see. There were citrus orchards and onion fields and Mexican workers to pick them. Danny Lyon was there to photograph them. In 1977, the year undocumented farmworkers staged a citrus strike in El Mirage, AZ. (and accused Border Patrol of staging retaliatory raids and destroying their camps), Lyon arrived in Maricopa County. He shot a black-and-white photo of just four of the many men who were spending their lives picking food for Americans to eat. 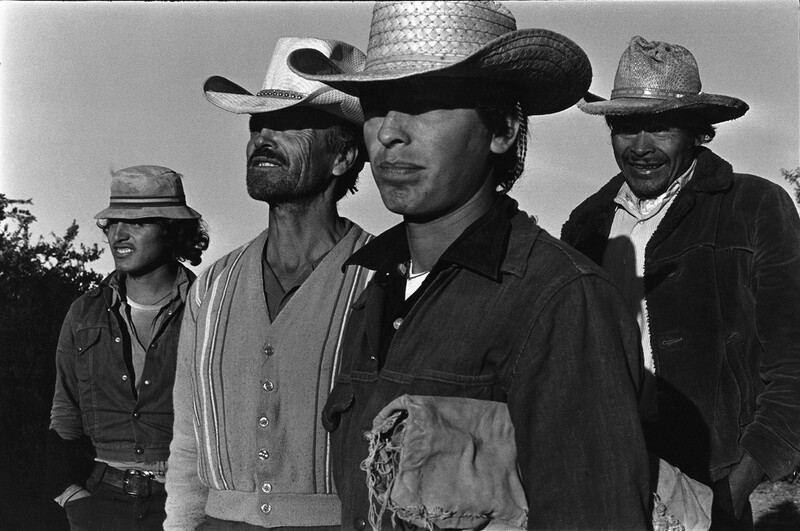 In Lyon's photo "Maricopa County, 1977," the unnamed men are heroes, four stoic figures facing directly into the Arizona sun, their eyes shielded by threadbare hats. One or two smile for the camera but the man in front is solemn, with his mouth closed and his jaw set, standing in for all workers determined to do whatever they have to to keep their families alive. Lyon, now 75, is a renowned photographer whose work is currently in a major retrospective traveling across Europe; now in Zurich, its next stop is Berlin. But Tucsonans don't have to cross the Atlantic to see Lyon's work. A smaller-size retrospective, Present Future, is at Tucson's Etherton Gallery right now. Nearly 80 photos are on view; most are vintage prints with the exception of six large-scale mural prints. Drawn from The Silverman Museum Collection and Etherton's own holdings, the photos cover all of Lyon's major series, from his superb early work documenting the civil rights movement in the south, to The Bikeriders series on a Chicago motorcycle club, to his most famous project, Conversations with the Dead, searing photos shot in Texas penitentiaries and farm prisons over 14 months in the late '60s. The Destruction of Lower Manhattan, a 1966 project, covers the leveling of blocks and blocks of 19th century New York buildings to make way for the World Trade Center, structures that, of course, would themselves later be violently felled by air attacks. The bravura farmworker photo is lesser known than other Lyon masterpieces, like "The Cotton Pickers" from Conversations, a beautiful and tragic image of weary black prisoners bent over in the field, plucking cotton from the spikey plants. But it points to the uncanny ability of Lyon, an "unapologetic activist," as the gallery calls him, to make documentary photos that resonate from the distant past to the present and on the future. To paraphrase photography critic Teju Cole, Lyon's pieces "compress history." "The Cotton Pickers," as Cole has written, evokes not only the hell of Texas prisons in the 1960s. It goes backward in time to conjure up the centuries of slavery in the United States, and fast-forwards to the present, when draconian penal laws have led to mass incarcerations in the U.S., particularly of minority men. Likewise, Lyon's "Maricopa County 1977," lionizing undocumented workers in the year of the El Mirage citrus strike, could as easily have been shot in 2017, at a time when migrants put some 60 percent of America's food on its tables. Earlier this year, near El Mirage, migrant onion pickers working with temporary visas were being underpaid so badly and housed in such wretched conditions the U.S. Dept. of Labor had to step in. And the civil rights series, which Lyon began when he was still an undergrad history major at the University of Chicago, easily connects to the Black Lives Matter movement of today. The pictures document a black protester being carried away hand and foot by heavily armed white cops, white segregationists jeering protesters, and black mourners grieving the loss of a murdered loved one. As Lyon's camera proves, the arc of the moral universe does not always bend toward justice. But Lyon is more than a documentarian. He makes photos that are works of art, catching Cartier-Bresson's "decisive moment" in beautiful compositions. "The Dominoes Players, Walls Unit, TDC," 1967, from the prison series, conveys the boredom of life behind bars, with two men at a table, passing the time by playing a repetitive game. The subject is despair, and Lyon captured it inventively. He's positioned himself, somehow, above the table and points his camera down to the tops of the men's heads, casting the composition as a piece of geometry anchored by the rectangle of the table and the symmetry of its four stools. The Bikeriders records tough guys and sometimes gals on macho bikes (Lyon was a member of the club) but his photos of these cool figures are lyrical. In "Cal, Elkhorn, Wisconsin," 1966, a motorcycle rally is underway in the countryside on a chilly day, and large men and women alike burrowing into their leather jackets. Front and center, though, is a giant portrait of one of the tough guys, his face beautifully reflected in the mirror of his bike. "Route 12, Wisconsin," 1963, one of Lyon's most popular images, is pure poetry. A half-dozen bikers are seen from the rear, cruising together in a brotherly band, cresting a small hill and riding into the distance, disappearing onto the future and the past.